Breaking news: il Milan è campione d'Italia! 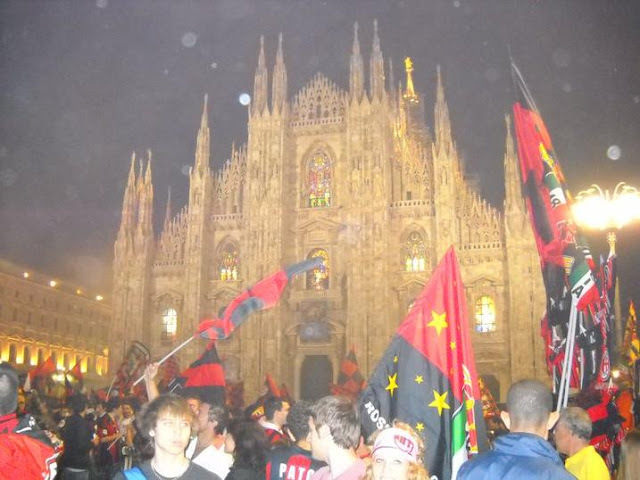 Now it's official :), AC Milan won the Italian league, 3 weeks before the end. Two crucial numbers: 18, as the number of Italian leagues won, 18 as the number of international trophies. And 11 as Ibrahimovic number, 11 as 2011, special year to be champions, as it's Italy's anniversary. Another confirmation about Ibra: where he goes to play, he wins the championship, every year. This is happening since 2003-04 (Ajax, Holland) then in Italy, Juventus, Inter Milan, then in Spain with Barcelona and now AC. More celebration next Saturday 14 May, with the players on a bus around the city. Beckham (he also had an accident this morning in Los Angeles, as at the end of this video) wrote a message: "just been watching my old teammates at Milan win the Scudetto. I want to congratulate them and everyone at the club for a great season. They deserve it..."
"The best of" the season video on the right column. songs: Abracadabra (Ibracadabra :) by the Steve Miller Band, The Best (Tina Turner), Mamma mia (Abba, Swedish as Ibra), The winner takes it all (Abba), all songs from around the years when these players were born.